Abstract: Changes in sea surface temperatures in the Pacific Northwest are associated with changes in reproductive and feeding tactics in colonial seabirds. Warm years in the El Niño–Southern Oscillation are associated with short-term "lifeboat" tactics such as egg cannibalism that are not sustainable over the long term. Mathematical models suggest that prolonged rises in sea surface temperature can create tipping points that allow colony collapse. 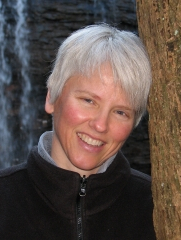 Shandelle M. Henson is Professor of Mathematics and Professor of Ecology at Andrews University with a PhD from the University of Tennessee, Knoxville. She uses dynamical systems theory to describe, explain and predict the dynamics of ecological systems and animal behavior. She is one of the senior scientists in the interdisciplinary Seabird Ecology Team, a research group funded by the National Science Foundation.